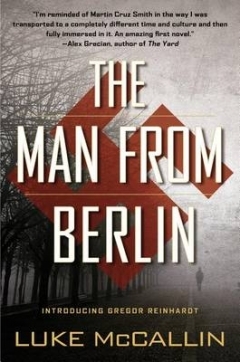 The Man From Berlin opening line: Reinhardt shuddered awake, again, clawing himself up from that dream, that nightmare of a winter field, the indolent drift of smoke and mist along the hummocked ground, the staccato line of the condemned and the children’s screams. It has taken me a month to read a book. This is most unusual, but hopefully the review will explain why. The book is set in Sarajevo in May of 1943. As you can see from the opening line, each sentence takes a long time to read. And the story takes a bit of concentration to follow for a few reasons. The first being is I was not always quite sure of the “back” story to the characters. This was provided at the end of the book which by then was rendered useless. The second reason is that the author insisted on using the German terms for the army personnel. Even though the English equivalents were given at the beginning of the book, I think it would have sufficed to ‘translate’ everything into English for the readers. The foreign words could have been replaced with English words to make the reading easier. Despite the difficulty in reading this book, I enjoyed it. It provided me with some insight into the area and offers a different story to what one has come to expect from books written around World War II. Reinhardt is the central character and he has to solve a double murder, as well as unleash the demons tormenting him. He fought for a Germany he believed in during WWI but he does not have the same loyalty to his country this time. It is this conflict that allows him to solve the murders and move on with his life. I appreciate your tenacity to stick with this book all the way through, I find that I will give a movie or book about 30 minutes until I move on, lol. Good for you for sticking with it despite difficulty Tandy. I do that also. So glad that you enjoyed it.